Commodity currencies generally behave in very similar ways but this week we had a major divergence in the performance of AUD and NZD, leading to a sharp rally in the AUD/NZD cross. The Australian dollar traded strongly thank to the Reserve Bank of Australia’s upbeat tone. The central bank noted that conditions in the global economy improved in recent months with RBA Governor Lowe also saying it is hard to say if the Australian dollar is too strong given the reasonable growth outlook. 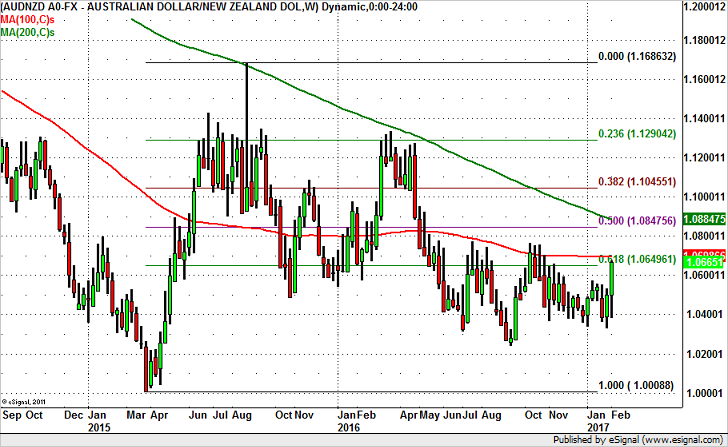 The New Zealand dollar on the other hand was hit hard by less enthusiastic comments from the Reserve Bank of New Zealand. Although the RBNZ left interest rates unchanged and Governor Wheeler said their easing bias has been removed describing current policy as “very neutral”, traders latched onto the central bank’s call for a lower currency. Assistant Governor and Head of Economics McDermott also said the central bank wants to make sure inflation will hit 2% before tightening because the strong currency will continue to press down tradables inflation. These comments were aimed at squashing any expectations for RBNZ tightening and should keep NZD under pressure. So fundamentally we believe AUD/NZD has what it takes to break through 1.07. Taking a look at the weekly chart however, AUD/NZD has major resistance between 1.0650 and 1.07. Not only does the 61.8% Fibonacci retracement of the Mar to August 2015 rally hover right near those levels but the 100-period SMA is at 1.07 so this level may be tough to break. If AUD/NZD fails at 1.07, a correction could take the pair under 1.06. However if AUD/NZD blows past 1.07, the next stop should be 1.0850.